Software as a Service (SaaS) continues to grow in popularity across a wide variety of disciplines. Contractors, too, are adopting the approach for everything from bidding to systems design. LinkWare Live from Fluke Networks offers a similar approach to the task of cable certification and systems approval. So what does that look like in practice to a typical installer? A DAY IN THE LIFE OF A DATA NETWORK INSTALLER. 10:00 AM Almost the entire first floor, containing over 300 links, has been tested. By the time he goes for his coffee break, the installer has activated the access point on his smartphone and enabled the Sync function on his cable tester. As a result, all the testing results are now being transferred and immediately available to the Project Manager in the central office. At the same time, test limits, scope of the test, cable IDs and the cable types for the next project, beginning in two days’ time, are transferred to the field tester as well. New project details are defined in advance by the Project Manager and entered into the SaaS via a web interface. Given the fact that the Project Manager typically has knowledge of and access to all the project details, including AutoCAD™ drawings, tender documents, functional specifications, minutes of meetings and last-minute amendments, he is in the best position to define all the test details. A SaaS for the management of both projects and the cable tester, that also supports list imports of cable IDs from popular tools like AutoCad, Excel™ and VISIO™, not only enhances efficiency but also helps prevent errors. The advantage of such a workflow is obvious if we look at experiences from the past: it was frequently necessary to re-test an entire or a large portion of a project because the first time around the technician had selected the wrong Pass/Fail limits or saved the results using an incorrect cable ID. Figure 1. 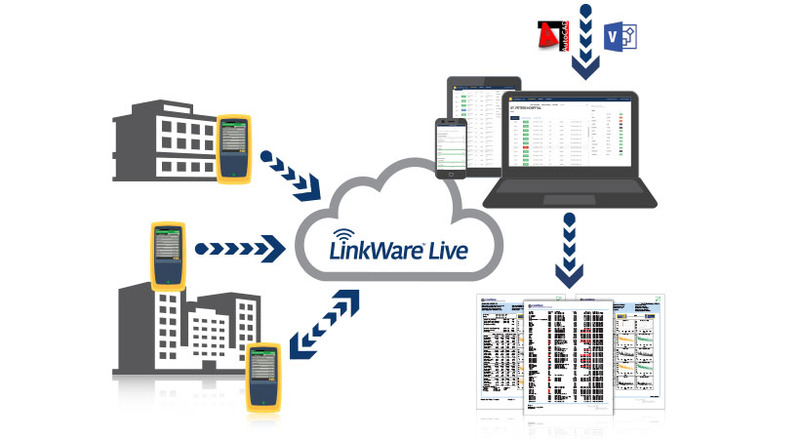 The LinkWare™ Live workflow. 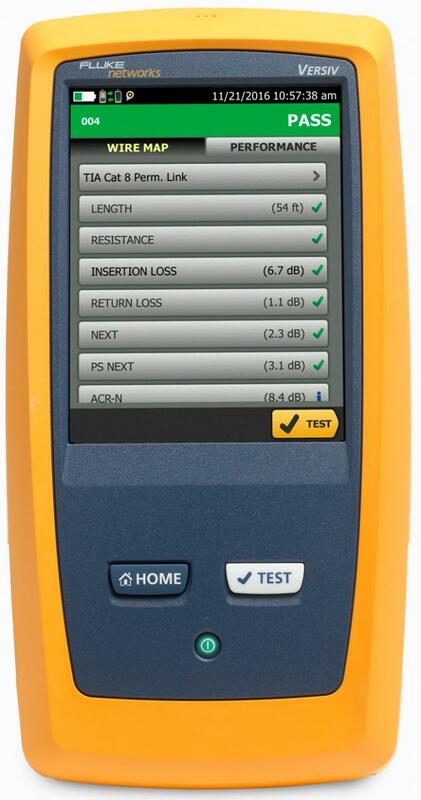 Often, cable testers are evaluated by the time it takes to test a single link. This parameter is important but not essential because if we would assume that a link could be tested twice as fast as before, it would not result into projects being tested in half the time. It’s like driving a car; the time gained driving on an open highway is more than lost in traffic jams. This means one is better off preventing and avoiding traffic jams. Back in 2012, 800 installation companies were asked where they experienced wastes of time when certifying newly installed copper and/or fiber structured cabling systems. Replies coming from installers operating in America, Europe and Asia revealed similar patterns. The information was significant as these 800 companies installed and tested more than one million media links a month. The above table lists the most common time wasters that installers identified when certifying newly installed copper and fiber based structured cabling systems. The lion’s share belongs to a category that we could call “Configuration and Administration”. If we are able to prevent these instances, the potential gain in efficiency and reduction of cost will be higher. A workflow which is supported by a SaaS and field testers that are able to communicate and exchange project details and test results with the same SaaS, has the biggest potential to lead to efficiency gains that will result into project cost savings. This enhanced workflow is possible because all involved team members can focus on their area of expertise. The Project Manager focuses on the test and quality plan, which involves test regimes, limits and standards as well as cable IDs and naming schemes. In the final stage, the SaaS will also assist the Project Manager in producing the necessary documentation which is often the last milestone before customer invoicing. This leaves the technician to focus on what he was trained to do best: test and troubleshoot. Figure 2. Labeling tools can access the identifiers in the SaaS database to save data re-entry and eliminate labeling errors. Most of the links on the first floor have been tested which means the project is on track. All links are passing with a margin in excess of 3 db, in compliance with the statement of work. 1:00 PM The remaining links on the first floor as well as all the links on the second have been tested. Two of the links were initially below expectations, but after reworking the termination, the second test demonstrated the expected performance and results were uploaded to the SaaS. 2:00 PM Technicians have started the process of installing and labeling the job that will be tested in two days time. The cable identifiers uploaded by the project manager in the morning are downloaded into the lablers at the project site. 3:00 PM The Project Manager synchronizes the most recent test results. The status summary demonstrates that testing on both floors is now 100% completed and a quick check reveals that two links had to be reworked to meet the statement of work criteria. In the next step he will create the project documentation. The invoice to the end customer will then follow in the final phase of the project. A cloud-based SaaS does not need to be limited to the “store & forward” of test results and the ability to pre-define project specific test configurations. The following two examples illustrate that there are more opportunities to enhance the project flow and increase profitability. Unexpected Cable IDs: Ad-hoc changes often occur during a project, which result in additional or modified links to be installed. If the SaaS is able to flag unexpected additional links or links with a modified ID, the Project Manager can add them to the project and ensure that documentation is updated and the additional outlay is included in the billing of the project. Asset Management (Figure 3): Avoid unnecessary project delays by tracking the last used location and monitoring the status of all testers to ensure they are always calibrated and running the latest firmware. The certification measurement report usually forms the basis for the award of a system warranty by the manufacturer of the cable installation system. 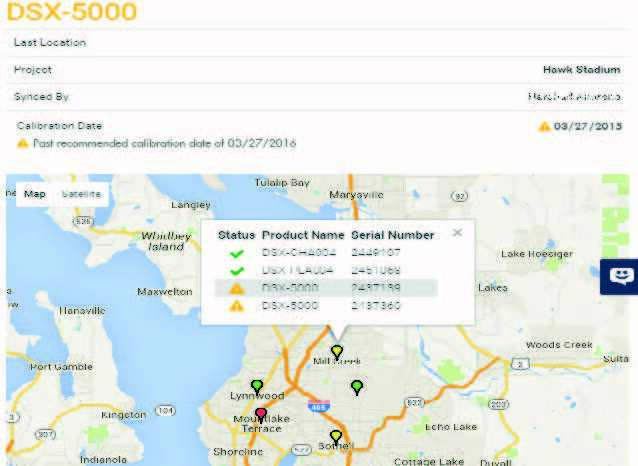 This system warranty is essential for the end-customer, but the manufacturer will only grant it if the tests were performed with equipment with a valid calibration. Test equipment often contains multiple measurement modules with different dates of purchase and expiration dates for the calibration status. The SaaS Asset Management tool issues an alert before the calibration expires, making it possible to schedule a calibration between projects. As a result, the risk is eliminated that a project cannot be successfully completed because the manufacturer rejected the request for a system warranty due to the usage of instruments with an expired calibration status. Figure 3. 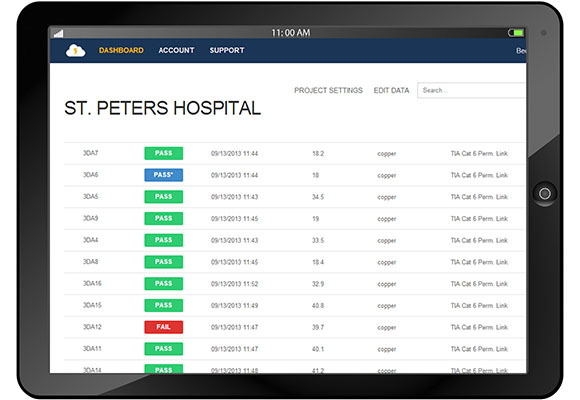 LinkWare™ Live Asset Management screen including location of testers and calibration date information. Eliminates the time and fuel wasted in driving testers back to the office to upload test results. Incorrect test configurations can be prevented ensuring certification jobs are done right first time. Any unexpected cable IDs are immediately flagged, highlighting ad-hoc changes in the field and eliminating cumbersome problem-solving after job completion. 100% testing of a project is ensured. Instrument utilization is optimized as they can stay out in the field and directly roam from project site to project site. The location of each tester can be tracked at any time and as a result a tester can be assigned to a technician on a timely basis. Accelerated documentation leads to warranty statements being promptly issued and installers being paid sooner. Complying with Privacy Guidelines: Cloud-based services are often associated with security risks. To put the risk in perspective an example from an adjacent sector can be used: The humidity and temperature in every room of a new bank building are recorded and transferred to a SaaS as part of the acceptance procedure for the newly installed air conditioning and heating. It is unlikely that someone gaining access to this information would be able to misuse it in any way. The same is also true for data relating to cryptic cable ID's, NEXT, length and insertion loss margins. However, this does not mean that there is no need for the SaaS to meet the national, and international regulations for safe data havens. The LinkWare™ Live privacy guidelines are clearly formulated as part of the terms and conditions for the usage of the SaaS. CertiFiber® Pro - Accelerates every step of the fiber certification process. CertiFiber Pro reduces the cost of fiber certification by two-thirds and features a three second loss measurement of two fibers at two wavelengths. CertiFiber Pro s’intègre avec LinkWare™ Live pour vous permettre de gérer les tâches et les appareils de test à partir de n’importe quel appareil intelligent sur Wi-Fi. L’interface utilisateur Taptive™ fournit des instructions simples sous forme d’animations pour éliminer le paramétrage incorrect de référence et les erreurs de « perte négative ». Future-ready design can be easily upgraded to support Cat 5 to Cat 8 certification, OTDR testing and double-ended Pass/Fail certification of fiber optic connector endfaces. Une solution prête à l’emploi tout en étant conforme aux normes régissant le flux inscrit. Analyse des résultats de test et création de rapports de test professionnels à l’aide du logiciel de gestion des résultats de test de câblage LinkWare™. 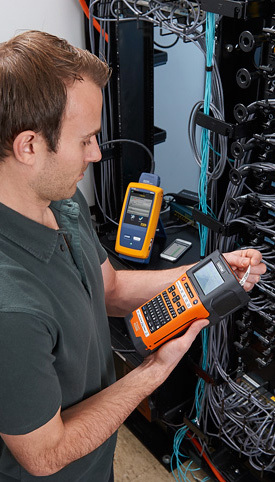 DSX CableAnalyzer Series – Accelerates every step of the copper certification process. LinkWare™ Live to let you manage jobs and testers from any smart device over Wi-Fi. Cette conception prête pour l’avenir prend en charge les modules de test de fibres optiques (perte, OTDR et inspection). Troubleshoot faults faster with the Taptive™ user interface which graphically displays the source of failures including crosstalk, return loss and shield faults. Analyse des résultats de test et création de rapports de test professionnels à l’aide du logiciel de gestion des résultats de test de câblage LinkWare™. OTDR OptiFiber® Pro : conçu pour les entreprises. 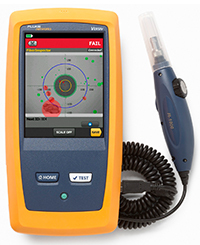 Fluke Networks’ OptiFiber Pro is the industry’s first OTDR built from the ground up to meet the challenges of enterprise fiber optic infrastructures. OptiFiber Pro OTDR’s ultra-short dead zones facilitate the identification of fiber patch cords in virtualized data centers. La technologie SmartLoop™ permet de tester deux fibres optiques dans les deux sens et de faire une moyenne des mesures, tel qu’exigé par la norme TIA-568.3-D en quelques secondes - sans devoir transporter l’OTDR à l’extrémité distante. Sa conception évolutive permet les mises à niveau pour prendre en charge une certification de Cat 5 à Cat 8, la perte de fibre optique monomode et multimode ainsi que l’inspection de la fibre optique. S'intègre avec LinkWare™ Live pour gérer les testeurs et projets issus de n’importe quel appareil intelligent. FI-7000 FiberInspector™ Pro : certification automatisée de la conformité/non-conformité des extrémités de fibres optiques en 2 secondes. Indication graphique des zones problématiques dues aux contaminations, piqûres, ébréchures et rayures. Certification aux normes de l’industrie - CEI 61300-3-35 et élimine l’erreur humaine des mesures d’extrémités.